Among the major limitations for cultivating biomass sorghum in temperate regions is low temperature in spring that results in low and non-uniform emergence. The adaptation of sorghum to tropical and subtropical highlands gives hint of genetic variation in cold tolerance during emergence. The objective of the present study was to detect marker–trait associations for parameters describing the emergence process under different temperature regimes. 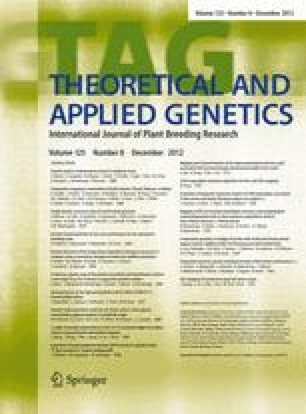 A diversity set comprising 194 genotypes was tested in nine controlled environments with temperatures ranging from 9.4 to 19.9 °C. The genotypes were fingerprinted with 171 DArT markers. A piecewise linear regression model carried out on cumulative emergence was used to estimate genotype mean performance across environments and to carry out stability analysis on the parameters of the regression model. Base temperature (T b) and thermal time required for emergence (E TS) were determined based on median time to emergence data. Identified QTL positions were compared to marker–trait associations for final emergence percentages under low (FEPcold) and normal (FEPnormal) temperatures. QTL for mean final emergence percentage (FEP), FEPcold and FEPnormal, T b and E TS were detected on SBI-01. Other QTL-rich regions were located on SBI-03, SBI-04, SBI-06, SBI-08, and SBI-09. Marker–trait associations for T b and E TS co-localized to QTL for the across environment stability of FEP and the median time to emergence or emergence rate, respectively. We conclude that genome regions on six chromosomes highly influencing cold tolerance during emergence are promising for regional association studies and for the development of stable markers for marker-assisted selection. The online version of this article (doi: 10.1007/s00122-012-1941-4) contains supplementary material, which is available to authorized users. We thank Katharina Meyer for excellent technical assistance and gratefully acknowledge the German Federal Ministry of Education and Research (BMBF) for funding the project (BioEnergie 2021, Project No. 03154211). The authors would like to thank the anonymous reviewers for the helpful comments on the manuscript.